It happened shortly after Remko Popma contributed something which is now called the “AsyncLoggers”. Some of you might know Log4j 2 has AsyncAppenders already. They are similar like the ones you can find in Log4j 1 and other logging frameworks. I am honest: I wasn’t so excited about the new feature until I read the tweet on its performance and became curious. Clearly Java logging has many goals. Among them: logging must be as fast as hell. Nobody wants his logging framework to become a bottleneck. Of course you’ll always have a cost when logging. There is some operation the CPU must perform. Something is happening, even when you decide NOT to write a log statement. Logging is expected to be invisible. and you can choose whatever your liking is. Until we got Remko’s contribution and Log4j 2 became “insanely fast”. Small software projects running one thread might not care about performance so much. When running a SaaS you simply don’t know when your app gets so much attraction that you need to scale. Then you suddenly need some extra power. 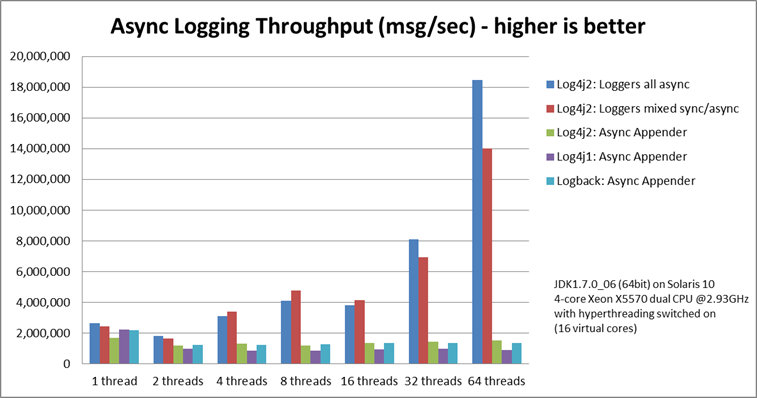 With Log4j 2, running 64 threads might bring you twelve times more logging throughput than with comparable frameworks. We speak of more than 18,000,000 messages per second, while others do around 1,500,000 or less in the same environment. I saw the chart, but simply couldn’t believe it. There must be something wrong. I rechecked. I ran the tests myself. It’s like that: Log4j 2 is insanely fast. As of now, we have a logging framework which performs lots better than every other logging framework out there. As of now we need to justify our decision when we do not want to use Log4j 2, if speed matters. Everything else than Log4j 2 can become a bottleneck and a risk. With such a fast logging framework you might even consider to log a bit more in production than you did before. Eventually I wrote Remko an e-mail and asked him what exactly the difference between the old AsyncAppenders and the new Asynchronous Loggers is. In other terms, the AsyncAppender use a first-in-first-out Queue to work through messages. But the Async Logger uses something new – the Disruptor. To be honest, I had never heard of it. And furthermore, I never thought much about scaling my logging framework. When somebody said “scale the system”, I thought about the database, the app server and much more, but usually not logging. In production, logging was off. End of story. But Remko thinks about scaling when it comes to logging. “Looking at the performance test results for the Asynchronous Loggers, the first thing you notice is that some ways of logging scale much better than others. By scaling better I mean that you get more throughput when you add more threads. If your throughput increases a constant amount with every thread you add, you have linear scalability. This is very desirable but can be difficult to achieve.”, he wrote me. “Comparing synchronous to asynchronous, you would expect any asynchronous mechanism to scale much better than synchronous logging because you don’t do the I/O in the producing thread any more, and we all know that ‘I/O is slow’ (and I’ll get back to this in a bit)”. If you believed that like me, take a seat and a deep breath. We were wrong. “What may surprise you is that this is not the case.”, he wrote. “So your total throughput remains more or less flat! AsyncAppenders are faster than synchronous logging, but they are similar in the sense that neither of them gives you more total throughput when you add more threads.”, he told me. It hit me like a hammer. Basically instead of making your logging faster with adding more threads you made basically: nothing. After all Appenders didn’t scale until now. I asked Remko why this was the case. “It turns out that queues are not the most optimal data structure to pass information between threads. The concurrent queues that are part of the standard Java libraries use locks to make sure that values don’t get corrupted and to ensure data visibility between threads.”. Wow. After all these years of Java programming I actually felt a bit like a Junior programmer again. I missed the LMAX disruptor and even never considered it a performance problem to use the Queue. I wonder what other performance problems I did not discover so far. I realized, I had to re-learn Java. I asked Remko how he could find a library like the LMAX disruptor. I mean nobody writes software, creates an instance of a Queue-class, doubts its performance and finally searches the internet for “something better”. Or are there really people of that kind? “How I found about the Disruptor? The short answer is, it was all a mistake.”, he started. “One thing I came across that I should mention here is Peter Lawrey’s Chronicle library. Chronicle uses memory-mapped files to write tens of millions of messages per second to disk with very low latency. Remember that above I said that “we all know that I/O is slow”? Chronicle shows that synchronous I/O can be very, very fast.“. The Disruptor google group is also highly recommended. My bookmarks folder went full after reading this e-mail, and I appreciate the lots of starting points for improving my knowledge on Java performance. Should I use AsyncLoggers by default? I was sure I want to use the new Async Loggers. This all sounds just fantastic. But on the other hand, I am a bit scared and even a little paranoid to include new dependencies or new technologies like the new Log4j 2 Async Loggers. I asked Remko if he would use the new feature by default or if he would enable them just for a few, limited use cases. Isn’t it risky to log to use Log4js AsyncLoggers? But considering that Log4j-1 had serious threading issues and the modern world uses cloud computing and clustering all the time to scale their apps, isn’t asynchronous logging some kind of additional risk? Or is it safe? I knew my questions would sound like the questions of a decision maker, not of an developer. But the whole LMAX thing was so new to me and since I maintain the old and really ugly Log4j 1 code, I simply had to ask. (Sidenote: A stable version of Log4j2 can be expected soon, most likely autumn 2013). Sounded good to me. And yes, I can perfectly agree with that from my own observations on the project, though I personally did not write code in the Log4j 2 repository. Reading Remko’s message I learned three things. First, I had to learn more about Java performance. Second, I definitely want to make my applications use Log4j 2. As first step, I will enable it in my Struts 2 apps, which I use often. Third, a web application framework using the LMAX Disruptor might blow us all away. I would like to give a big thank you and a hug to Remko Popma for answering my questions and working on this blog post with me. All errors are my own. Twenty years ago, Remko went to Japan to get better at the game of Go. Somehow he never made it back. Remko started doing software development for Japanese software companies, had a brief stint as a freelance developer, ran a software company together with a Japanese partner, and is now leading algorithmic trading development in Mizuho Securities IT. He lives in Tokyo with his wife Tomoe and son Tobias. Reference: Log4j 2: Performance close to insane from our JCG partner Christian Grobmeier at the PHP und Java Entwickler blog. Great Article. Only one correction, is Trisha Gee (https://plus.google.com/113962597054936586655/posts) not Trisha Lee. She made great articles and presentations on the disruptor. very exciting. Thanks for the review. Do you think there will be any issues using Log4j or Log4j2 in Android development? The jar’s will just drop in and everything will run on an Android platform? ?